KNAACK LLC is helping to support the good works of the Salina Rescue Mission in Salina, KS, which was recently profiled on country music star Trace Adkins’ new show that seeks out and lends a hand to the regular, small-town men and women he calls Great American Heroes. The Great American Heroes program follows Trace on his nationwide Songs and Stories tour as he takes time between shows to visit with ordinary Americans who in the face of adversity are giving of themselves for the good of their fellow man. 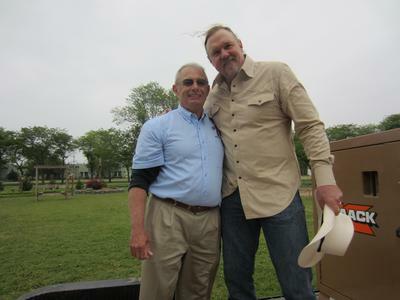 During his visits, Trace presents a special gift to each hero to help them continue their work, and also invites them as special guests to his concerts. In joining with Trace’s objective to recognize and assist these Great American Heroes, Knaack has donated two jobsite storage boxes to the director of the Salina Rescue Mission, Steve Kmetz, who was featured in the first episode of the show. In one segment, Trace visits with Steve, a minister at the mission he operates that helps homeless men learn a trade, as well as the life skills that will enable them to get jobs and improve the quality of their lives. One of the training programs Kmetz has implemented is a series of building projects that teach the shelter residents wood-working and other building skills they can take with them when they leave the shelter. Under Steve’s direction, the men learn how to work as a team, while at the same time build their self-confidence. The donation of the two Model 1020 Monster Box® Cabinets to Steve Kmetz and the Salina Rescue Mission gives the men a secure and weatherproof place to store the tools they need each day on the jobsite. Throughout the company’s history, Knaack has supported a number of charities and institutions by hosting local fund-raising events and making donations to organizations such as the United Way, Habitat for Humanity, the American Heart Association, McHenry County College, and Elgin Community College, among others. Knaack LLC manufactures and markets a complete line of WEATHER GUARD® truck and van equipment, including drawer units, shelving and cabinets, and racks for full size and compact pickups, vans and utility vehicles, as well as KNAACK® jobsite storage equipment, including storage chests, work stations, rolling work benches and hand tool boxes.